Find out what they changed, then browse more real home transformations and find out how to plan, design and cost your garden transformation. 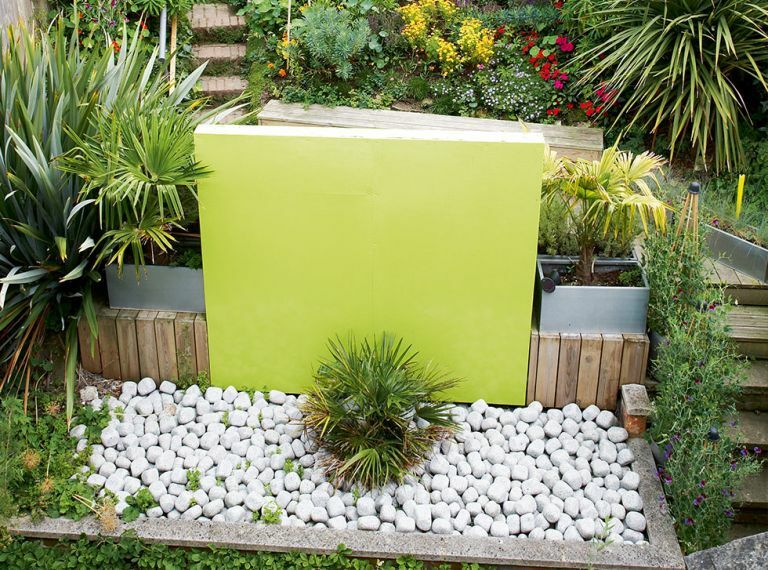 Use our guide, too, to find out how to design a sloping garden. The couple had moved from London and were used to gardens that were no bigger than 40ft. They didn’t have any experience of a large outdoor area or a sloping space. Before planning the details, the couple had all the trees felled to give them a blank canvas to work on, then they started drawing up a new layout. With no direct access to the garden other than through the house, Nicola and John knew it would be impossible to dig, level and rearrange all three soil levels, so they decided to create a series of linked decked platforms to make the level areas useable. ‘We wanted seating zones at every level, so that each section would be contained and have its own purpose as a separate outdoor room,’ says Nicola. They began by building large decked areas on the sections. In the space nearest the house John made a seat from marine grade plywood which was designed to be big enough to relax on. Meanwhile, Nicola put in an evergreen scheme of fast-growing cabbage palms and several ornamental trees to screen the seat so it wouldn’t be overlooked at any angle. Find out how to design the best garden deck. ‘It has worked so well that we’ve been able to sunbathe in complete privacy since they have grown,’ says Nicola. The centre section had to be relatively small because of the shape of the land, so the couple turned it into a cosy dining area, with a pergola over it. As the third decked section was to be the children’s space, they kept flowerbeds to a minimum so there would be plenty of room for Iggy and Lula to play and somewhere for a climbing frame and paddling pool in the summer. Nicola and John carried out the work in stages over three summers, with the last summer mainly devoted to planting, which presented its own challenges. ‘I hugely under-estimated the cost of plants to fill such a big garden and made the mistake of wanting quick results, which you don’t get with perennials as they need time to establish, so I had to invest in other plants to plug the gaps,’ says Nicola. The couple were keen on making sure that the garden would be safe for the two children to run around freely, so they blocked off one steep drop leading to a concrete basement well by placing a permanent seating area there. ‘It also creates a natural pausing point at the first level, so it isn’t simply a ”corridor“ leading to the steps. It has become the perfect spot to relax and unwind near the house,’ Nicola explains. Nicola and John have enjoyed watching guests’ reactions when they discover the different sections in the garden, which also includes a small vegetable patch and pond. The couple line the steps with tealights and garden lanterns when they hold garden parties. ‘It creates a lovely magical effect on the paths to all three zones,’ says Nicola. For more details on SoUrban Design, visit Sourbandesign.com.